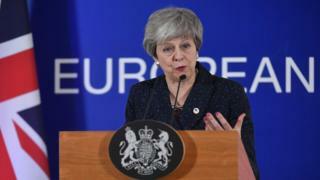 On Thursday night, after eight hours of discussions, European Union (EU) leaders agreed that the UK can delay Brexit, but there are certain conditions. 22 May - If Members of Parliament (MPs) approve Prime Minister Theresa May's Brexit deal next week, then the UK will leave the group of countries on this day. It has been set for this day because it leaves enough time to do everything needed to put the deal in place, but it is also the day before voting begins in the European Parliament elections, in which the UK government does not want to take part. 12 April - If MPs reject the deal, then the UK will need to leave the EU on 12 April with no deal, or have decided a new plan by then. The UK will need to tell the EU by this date what it plans to do next, which could be asking for another extension to Brexit. However, EU Council President Donald Tusk has said there could only be another delay if the UK agrees to stand in the European elections in May. Mrs May is now on her way back from Brussels hoping to persuade MPs to approve her deal next week. Why are we talking about something called Article 50? She has said that MPs have "difficult jobs to do" and now have a "clear choice", on which they are expected to vote next week. "I hope that we can all agree we are now at the moment of decision. And I will make every effort to ensure that we are able to leave with a deal and move our country forward," said Mrs May. The next big moment will now be when MPs vote on Mrs May's deal for a third time. Parliament has not set a date for this yet, but it is due to be next week. While the UK cannot delay Brexit any longer without the agreement of EU leaders, many members of the public are pushing for the government to revoke - or cancel - Article 50 as a way to stop the UK from the leaving the EU without a deal. Article 50 is the name of the legal process by which the UK will leave the group. 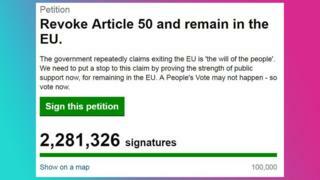 By 6:30am on Friday morning, well over 2 million people had signed a petition calling for the government to do this. But for many others, including the prime minister, revoking or cancelling Article 50 - and effectively cancelling Brexit for the time being - would go against the result of the referendum in the UK voted for in June 2016. It could also be seen as politicians admitting that they've given up on finding a solution to the disagreements. In a press conference, Mrs May referenced the petition, saying: "We didn't say, 'tell us what you think and we'll think about it'. We said, 'here's the vote, what is your decision and we will deliver on that'." Ugh, Brexit. Might as well rename every news channel "Brews". Ugh I’m so bored of brexit!